I always love going to Champoluc, not least because of the excellent small UK tour operator Ski 2, that specialises in the resort and is by far the biggest tour operator in the whole, underrated Monterosa area. They offer a range of accommodation from luxury (I stayed in La Rouja, a newly opened small hotel which has been beautifully renovated from an old building using local wood and other materials) to budget and family-friendly. And they offer an amazingly personalised service with private transfers from and to any flight at any of six airports within striking distance included in their very competitive prices. They picked me up in Courmayeur (where I was already) on Thursday morning and dropped me off at Geneva airport on Friday evening. By 10.30am Thursday I was skiing with local mountain guide Stefan and despite there having been no new snow for three weeks, he took me down a splendid deserted valley away from all signs of lifts and civilisation down to Gressoney in the next valley. Then it was up via two successive powerful gondolas and a brand new cable car that opened in December and takes you to 3275m. 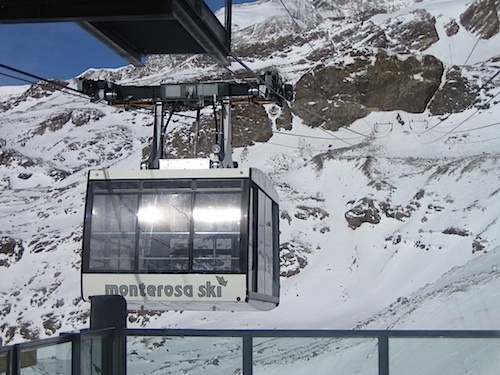 This long awaited replacement for the old lift to Punta Indren that closed three seasons ago serves only off-piste terrain – back down towards Gressoney or down (after a short climb up to a traverse) to Alagna (a descent of over 2000m vertical). 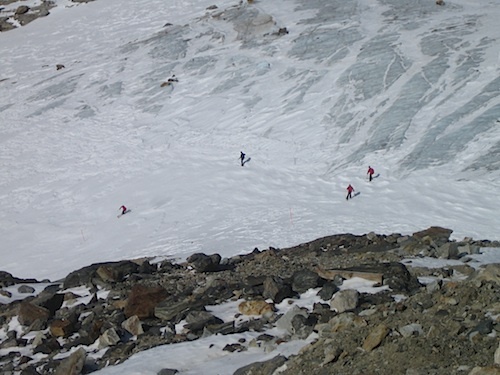 You should have a guide to explore this huge area of very varied off-piste (though one run down towards Gressoney is marked by poles) and, as lots of signs make clear, an avalanche transceiver, shovel and probe are essential for safety too. But the area isn’t just for off-piste. There is a network of largely intermediate slopes spanning three valleys that are great for cruising. And by Friday morning the pistes were shin-deep in fresh light powder that started falling late on Thursday night – enabling me to have a magic morning among falling snow with Ruaridh (pronounced Rory), a Scottish instructor from Ski 2’s own ski school. As well as exploring the powdery pistes we enjoyed excellent tree skiing (unusual for Europe) in the Mandria forest above the Frachey area of Champoluc’s local slopes. This area is now served by another lift that was new for this season – a fast funicular from the valley that is a welcome replacement for the slow old double chair that used to take you up. The snow continued all day. And as I was driven to Geneva airport, it was falling right down to motorway level in the Aosta valley and continued on the Chamonix side of the Mont Blanc tunnel. Anyone in Chamonix or the Aosta valley this coming week should have a great time in all the fresh snow.